Carepeutic® Acu-Sole Swing Motion Shiatsu Foot Massager with Kneading Massage and Soothing Heated Therapy, professionally designed for plantar pain relief, healing life in a joyful way! Stop being depressed with painful, sore, and tired feet. Sit back and relax, let this Carepeutic® Acu-Sole Shiatsu Foot Massager give your foot an optimum and comprehensive massage. 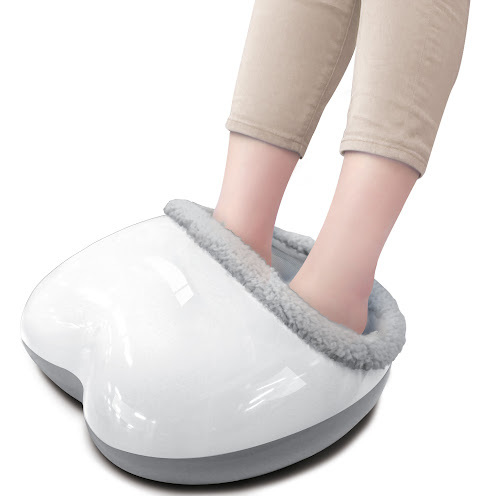 Carepeutic® Acu-Sole Swing Motion Shiatsu Rolling Foot Massager is a revolutionary foot pain relieving device. It is the first shiatsu foot massager that completely utilizes the principle of foot reflexology and integrates the essences of ancient acupuncture theory, combining shiatsu, kneading, rolling, and swing motion massage with heated therapy all in one. It heals the plantar fascia and stimulates the reflection zones of sole by providing joyful shiatsu acupressure massage on your foot. It is a foot bone pain relieving primary machine that helps improve your foot with weight-bearing and absorbing impact. This massager is equipped with both shiatsu and rolling massage with rollers and shiatsu balls scrolling up and down the longitudinal arch on sole. With the soothing heated therapy function, it can effectively dig into deep tissue and provide comfortable soothing therapy massage on the whole foot as well as to the whole body because feet have plenty of nerve points that are tightly connected with whole body organs and circulation systems. The swing massage function with backward or forward 360 degrees rotating plus its soothing heated therapy, it delivers acupressure massage to every nerve point on sole, effectively melts away tension on your tired, aching feet, and relieves tightness and pain on heel bone and metatarsal bones all around the foot bed. The compact and lightweight design makes it very convenient for storage or moving. Its zipped fabric cover is detachable and washable, a great way to maintain hygiene. Go ahead and use this Carepeutic® Acu-Sole Shiatsu Foot Massager to reflex the acupressure regions on sole, to help relax, stimulate blood circulation, reduce stress, and to relieve tension, ankle pain and fatigue on foot. Completely utilize the principle of foot reflexology and essences of ancient acupuncture theory, combining shiatsu, kneading, rolling, and swing massage with heated therapy all in one. Shiatsu and Swing motion massage with rolling and 3D rotating mechanism, heal the plantar fascia and stimulate the reflection zones of sole. Shiatsu and rolling massage are located in two separate groups based on the sole nerve points, giving your foot a comprehensive spa massage. 3D Shiatsu Massage: Six shiatsu massage balls located on the rear area of sole, providing 360 degrees shiatsu massage on rear sole and giving you optimum relaxation and relieving ankle joint pain. Swing Motion Massage: Six rolling massage balls located on the front area of sole, scrolling up and down the longitudinal arch with rolling massage, stimulating the acupuncture points and acupressure regions on sole. 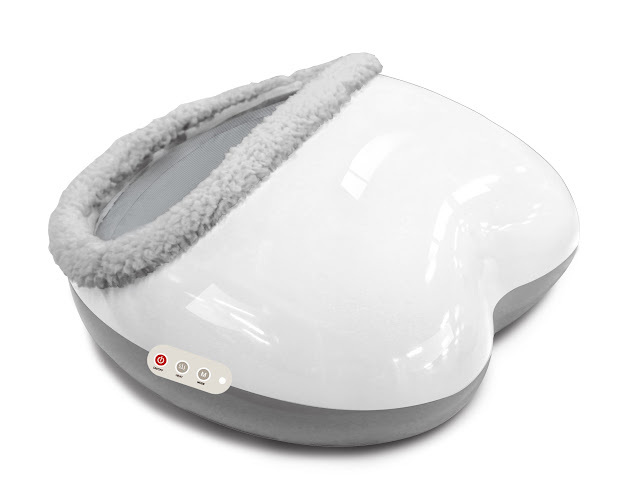 With soothing heated therapy, improve blood circulation and deliver nutrients to all parts of foot bed. Bring you optimum state of good health. Giving your feet a full-set spa massage, relieving painful, sore, and tired feet in just 20 minutes of preset massage time. With 2 massage modes to choose, selective forward and backward massage directions. With removable and washable fabric cover, easy for cleaning and maintaining hygiene. Compact and light weight design, convenient for moving and storage. With overheat protection system. Automatically shut off when the temperature reaches 65C (149F). Removable and washable cover, great for maintaining good hygiene. Compact design, convenient for storage or moving, simply slide it underneath of bed or table. Press the ON/OFF once to turn on massager. The product will automatically start its Mode 2 massage program for 20 minutes. Press the HEAT once to turn On/Off the heated therapy function. Press the Mode once to change from Mode 2 to Mode 1 to change the rolling and shiatsu massage direction. Mode 1: Forward rolling massage and shiatsu massage. Mode 2: Backward rolling massage, scrolling up and down (swing motion), shiatsu massage, and heated therapy. (Default, Green Light is on). Press the ON/OFF once again to turn off the power completely.